IMG_1384, originally uploaded by All Things Mimi. I needed a dish to take to a baby shower this week, and I thought this would be perfect. Turns out it was! The only aggravating thing about this recipe is all the chopping. Had I been making this for myself at home, it would have been less processed. But for a special occasion, the cubing was a must. Whisk jelly, sugar, orange juice, jalapeno and vinegar in a large bowl. 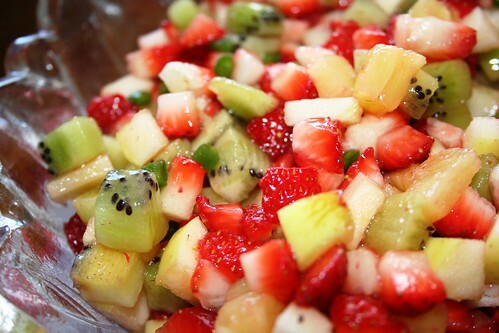 Add apples, strawberries and kiwis and toss to coat. Adjust oven racks to the upper middle and lower middle positions and heat oven to 350 degrees. Combine sugar and cinnamon in bowl. Lightly coat tortillas on both sides with cooking spray (I used vegetable oil) and cut each into 6 wedges. Arrange tortillas in a single layer on 2 baking sheets and sprinkle sugar mixture evenly over top of tortillas. Bake until golden and crisp- 10 to15 minutes, switching and rotates sheets halfway through baking time. Serve with salsa. This sounds great to serve to a bunch of kids! I've never tried to make cinnamon chips, but I do like eating them. I'm going to try this out soon, and let the kids help me out.